David wrote: ‘’Lord, place a guard at my mouth, a sentry at the door of my lips (Psalm 141:3). And his son Solomon added: ‘’Be careful what you say and protect your life. A careless talker destroys himself. (Proverbs 13:3). It was sometime last year when a close relative living in Ndola informed me that a member of an opposition party had told him that after the party gets into power in 2021, there would be an enquiry to establish that I am not a genuine member of the Bemba royal family since my great-great grandmother was not the genuine person who was later brought back after the primitive Ngoni savages kidnapped her. At that time I did not take it seriously, but of late I was informed that more people had joined in and indeed in March 2018, the same fellow travelled to Kasama to meet the most senior among the sons of chiefs whom we regard as the ‘’alderman’’ of the Bemba royal family and he is actually our ‘’cultural bank,’’ because of his wide knowledge of our traditions and norms since he is the only living survival of the previous generation of our ancestors. And unfortunately he did not go there to seek clarification, but he began to argue when the chief tried to explain to him about the whole truth. And he just finally dismissed him from the palace. Chitimukulu Chitapankwa’s sister Kasonde (Chandamukulu II) had two sons Mubanga Chipoya (Chief Mwamba III) and Mutale Sichansa(Senior Chief Nkula II) and two daughters, Kangwa Chonya and Chimbabantu. Kangwa Chonya had four sons, Kanyanta (later became Chitimukulu VIII); Luatila (later died as Chief Nkolemfumu III); Mubanga (later became Senior Chief Mwamba V) and Mboonkali (died as Chief Nkolemfumu V) and the only daughter Chilufya died before she had married. And here is the history of my royal lineage through Chimbabantu (later Chieftainess Chandamukul III). In the ‘’History of the Bemba’’ Andrew Roberts wrote: ‘’The Ngoni recruited support among the Lungu, Mambwe, Namwanga and Iwa. They returned to Manga with a large force and launched a successful attack, in which they killed Mukukamfumu II, Kasonde, a sister of Chitimukulu Chitapankwa and captured her daughter Mwango Chonya (later known as Chilobelobe: meaning the Lost One)(ibid. p. 145). Lying is defined as: ‘’To say or write something which is not true in order to deceive someone.’’ God said: ’’I hate and detest all lies (Psalm 119:163).’’ Solomon wrote: ‘’The Lord hates liars, but is pleased with those who keep their word.’’ (Proverbs 12:22). A lie-detector is defined as: ‘’a piece of equipment used to try to discover if someone is telling lies.’’ Our ancestors had also some kind of lie-detector i.e., traditional methods through the application of herbs or concoctions (umwafi) to prove whether one was telling the truth or lying. Dr. Mbita Chitala in ‘’A Short History of The Bemba People of Northern Zambia 1485-1946’’ has translated in English the application of umwafi from the Bemba history book called ‘’Ifya Bukaya.’’ The Bembas pretended to surrender and promised to pay homage to the Ngoni. Then three Bemba chiefs, Chitimukulu, Mwamba and Makasa sent ambassadors to the Ngoni. And since the Ngoni were not very sure if really and indeed the Bemba had surrendered they subjected them to the cultural lie-detector. And here is Dr. Chitala’s account: ‘’Then they summoned Mukuli who was the envoy representing King Makasa. They paraded him on a marked ground (mu cishilwa). A young man took a wooden spoon (akapande) and fed the poison (umwafi) to Mukuli and he swallowed the poison in whole. Then he was given a bark of a tree (icipande) to chew and swallowed. The young took the gourd vessel (ulukombo lwa lunda) which contained the poison and forced Mukuli to drink the concoction. After he drank he was forced to drink some water. Then they let him wander aimlessly in the marked yard (cishilwa). Then he suddenly began to vomit and he vomited so much that all the concoction that he had taken was let out. The people on seeing this commented thus: ‘atuuko mwafi, tali na kebo mundi’ (he has vomited all the poison, he has no case (kebo) in his stomach). ‘’The same poison test was administered to Kapande, the envoy of King Mwamba who also did not succumb to the poison test and he too vomited all the concoction and he also survived. Then they summoned Kapoma king Chitimukulu’s envoy and subjected him to the same poison test. When Kapoma drank the concoction, he started wandering aimlessly in the marked yard, but he developed dizziness (alapungushima). He did not vomit the poison as others had done. Eventually, the energy in Kapoma waned and he fell to the ground. The people watching Kapoma die slowly, poured scorn on him.’’ And tradition has it that besides going through the ‘’mwafi’’ poison testing Queen Chimbabantu had also to undergo various testings to really prove her identity. After the death of Chitimukulu Kanyanta in 1943, there was a succession wrangle between Senior Chief Musenga and Senior chief Nkula Musungu and the issue of Musenga’s family background was brought into the campaign. And here is what Brelsford wrote: ‘’…. Chimbabantu was too young to have been cicatrized with Bemba markings, but she was old enough to remember her relatives and it was her message, revealing her knowledge of them, by the traders that first drew their attention to the fact that she was alive. When she returned she had Ngoni face markings and her ear lobes had been slit and enlarged. But she proved her identity then, and was accepted as Chimbabantu by all branches of the clan up until the present, so I do not think any questioning can be allowed now.’’ (ibid. p. 13). (emphasis mine). King Solomon wrote: ‘’The Lord sees to it that truth is kept safe by disapproving the words of liars.’’ (Proverbs 22:12). From the foregoing we can deduce that Queen Mother Chimbabantu returned back home in 1890 and it is amazing that in 2018 thus 128 years later, somebody born in the 1960s claims to know much more! In fact Musenga who was born in a foreign land was accepted as a legitimate Bemba royal and became Chitimukulu 33, while his sister became Queen Mother Chandamukulu IV! Whereas, on the other hand, Brelsford had made it clear: ‘’ After her return home Chimbabantu (now Chandamukulu III) successfully married three Bemba and had two girls and a son, one child by each husband. These three are Kasonde, Mubanga and Mutale Nshika (currently chief Mpepo IV).’’ (emphasis mine). And of the ‘’two girls,’’ my maternal grandmother was Kasonde Chisuna. And it is just unbelievable to the extreme extent of how people can hate an individual like me! This is actually political stupidity which has surfaced in the current political arena. By the way this kind of ‘’stupidity’’ is not in the classical sense, which is usually thought as of a very low IQ. This kind of foolishness must be distinguished from the ‘’mental retardation.’’ And this kind of idiocy has been identified with inferiority complex arising mostly from highly questionable family background. This kind of stupidity comes with the supposed access to public media, popularity, success or displaced ambition. And according to Robert Sternberg, the stupid expert, such stupid persons believe that because they are so smart; the world does and should revolve around them. They are gripped by the omniscience fallacy. They are convinced that they know more than everyone else and can influence public opinion to their advantage and that others are just big idiots whom they can easily manipulate. These stupid individuals think in their foolishness that they know more about what happened in 1890 than anybody else! uyu naye ankale chabe! Why is he trying so much to be relevant? Is that poverty stricken Chiefdom not enough? Sometimes keeping quiet is the best wisdom in life. Clearly Sosala does not know when to speak and when not to speak; what to say and what not to say; how to say a thing and how not to say it. The timing, the content and the tone is all wrong. You would forgive people for seeing him as a PF surrogate, just as mukuni is seen as a UPND surrogate. I have always thought the chitimukulu to be very objective until now. To be bothered about rumours is a sign of insecurity if he is truly the rightful heir to the throne why is he bothered? Stop being petty about who is saying what…. talk about developing your people not your agenda! Ba Chitimukulu apapena mwatumpa fye, why all those insults in last part? What is this? Scumbag chief. Go away and hug a tree or something! You are such a bore. Ba fidumbo babili na be senukila imfumu. Natu beshiba ba fyatile. Mwanya na 2021 tamwakawine mube fimafumo . He should be brave enough to talk about his ordeal at the hands of Sata and PF when he was quarantined for “not being the legitimate chief.” He should leave the opposition out of his perceived troubles and scheming for PF funding. the matter is his opinion. he is entitled to it. It is not easy to remove a gazetted chief. Ba chief hold your fire and do not sow seeds of discord. Chiefs do not express their view anywhere and anytime. Be like a Litunga of Barotse. The only thing that stands the test of time is the truth. Why was Sata against your ascendance to Chitimukulu? The current President chased you from your palace when he was home affairs minister and you spent months leaving in a grass thatched house surrounded by the police. In the recent past you have become political and you seem to side with ruling party? The question is , do you have sinister reasons for doing so? Why are you afraid of 2021? We expect chiefs to be above partisan politics and embrace all as politicians come and go. Are you having sleepless nights of let? Politics of ‘in- groupings’ on his last paragraph reckoned his colleagues as , low I.Q , big *****S etc, if he is an ANVACULAR figure in BEMBA LANDSCAPES why is GROANING since 1890 ? Bembas have a well Organized ANCIENT LINAGE.This alderman need a FULL mirror. Did he write this before Sata became President as in opposition PF? He sounds like he is totally confused with time. Did he forget that GBM had to resign from Ministerial position because when the opposition PF came to power, they deposed him from his seat? Chiefs like everyone else must stop smoking akashanga. That is why in Tanzania they banned chiefdoms.Look at this now this is one of the few chiefs that appeared mature now literally playing in a pig house.Let us consider banning them,we shall save resources and unnecessary drama. This guy is a fraud! Former convict too… Sata knew you well. Those from Mufulira/Lusaka know your story too well. Keep quite. Be reminded that it is we the ones you are calling danderheads that pay for your so called wise chiefs upkeep.Your insults justify the case for these so called chiefs to be banned,we are now being insulted by their ungratefull subjects,let the subjects look after him and we shall not complain,so long as he remains a charge on national revenue dont expect us to sit back when he farts…. Sosalas undoing is that he’s always on the side of the sitting government. Before Sata became president and before Sosala became Mwinelubemba, Sosala was very pally with Rupiah. Him and Sata had some unrevealed differences and as soon as Sata became president he ordered the Post to stop publishing Sosalas articles and the Post obliged. My suspicion is that the person Sosala is referring to is a Sata follower and most probably an NDC member. This Sosala is not royal just see how his lineage is confusing. You ccanot pick what exactly he is saying and where his mother comes from. We have been saying all along. It is a shame to the bembas. I can go on and actually sosala ia a malawian born on the coperbelt. I can go on and sosala is a malawian born on the copperbelt. He is there on the throne as a sangwapo. It is better to be quiet unless there is something you are afraid of. We had past chiefs who were quiet and respected…. you can not be in the papers every week…umucinshi walapwa. It’s insensitive of Chitimukulu to call Ngonis as “primitive Ngoni savages”. Such vile remarks do not promote tribal harmony in the country especially when coming from a tribal authority like him. Bembas and Ngoni people are free to call each other any name and no offense will be taken. Of course there are areas where you cannot joke such as to do with either wife or husband belonging to someone. I agree. That is insensitive or if he meant it as a”cousinly” joke it should have been in quotation marks. That is what the person he is talking about said – not that that is what the Chitimukulu is saying. Understand context. In the Bemba tradition, once you have been chosen as the successor to the thrown of Chitimukulu, then that’s it. Only death can dethrone you. If it were discovered that you’re a wrong candidate , you’ll still remain in the position until death, but you won’t be allowed to see Babenye. It’s very unlikely that your remains will be accepted ku Milemba. I can give you a list of ba Chitimukulu who never saw Babenye, but I’ll leave it there. So this article is out of context, whether Sosala wrote it or not. That is not true. Chileshe chepela wasonge, a commoner, with the help of the Bisas overthrew the legitimate chitimuku Susula from Inchinga in 1836 or there about and enthroned himself chitimukulu. Susula was the last real royal to be on the throne. Since then chikeshe chepela’s discendants have been the chitimukulus. These are commoners. Sosala is strangling to explain where his parents came from. All the chiefs in Ichinga can explain themselves in a straight from Mukulumpe the king of the luba. I myself I am 9th generation from Mukulumpe in a straight line and so are many others from the old Royal Lineage in Inchinga. Sosala’s lineage makes an interesting reading. Somewhere he says some one had 2 children. Omg!. No one in Ichinga respects Chitimukulu. These are commoners. But we all know ngoni were primitive savages then. Great piece of history . You need to write a book so that we can fully understand our heritage and history. Iwe Kanyanta Sosala, just admit that the Bembas surrendered to Ngonis. Not ati, they pretended to surrender . You also left out the piece of history that Musenga, a Ngoni, became Chitimukulu. Ngoni our cousins from the East did we the westerners proud. We appreciate that your chiefs, just like our Litunga are quiet. Unlike the Bemba Sosala and the Chief Mukuni southern one. Always yapping and wanting to be seen. I would be grateful how the late Lackment Ngandu’s enthronment with the help of KK was taken by the Bemba speaking people and where he fits in, in the Royal line. A fraud of a Chitimukulu he is indeed. If this dude was for real, he would have called out Lungu who unleashed his lapdogs to block his ascendancy to the throne. Instead he is pretending nothing happened just so he could enjoy his breadcrumbs from Lungu’s corruption. The source of ‘Nchekeleko’ culture. The talk is cheap… for an entire Chitimukulu to run his mouth like this, speaking in tongues is really shameful. By the way, is he talking about GBM or Kambwili (Bembas help us here). There’s only one true and legit Chief/King in Zambia and that Litunga of Barotseland, the rest are just pretenders. Like it or not the Litunga by tradition is above this kind of pettiness… the throne is very highly respected. He needs to name the person or retract. You are a great man Mwinelubemba. Very proud of you DAD! And why is he quoting white authors to legitimize his chieftaincy and his right to the throne? Whites were relatively new to Northern Rhodesia, arriving much later than in Barotseland. He needs to quote wise elderly people instead. My thoughts exactly, had they written differently what would have been stance? Am surprised he went to the extent of quoting a non African…..Had respect for him with his insightful articles in the post,manje apa iyitaya chief. I USED TO HOLD THIS CHIEF IN HIGH ESTEEM BUT HE HAS JUST DECIDED TO SHOWN ME HIS BALLS. Last time there was an article purported to be written by him but the following day he refuted the that he was not the author. I hope he is not the author of the article otherwise it is a stupid article. Lusaka times the publishers can confirm whether it is from him or not otherwise how do they get written articles from prominent citizens without confirmation published? Imfumu yesu taili bwino iyo. Mwine lubemba bushe finshi fyalubana? Bushe ni ba chidumbo babili bakusenukila? Sosa kanabesa . Wilatina we mfumu. Balumbule ba fyatile pakuti tu balimune ba Mwansa Kabinga!! Bushe imfumu ngayapena, kuchita shani? Sosala sounds like he is confused or has a mental issue. Why can’t he just mention the names of the people he is scared of? The basis for the article (a rumour) is really childish, while the language from a leader of a large tribal grouping is rather vile. I do hope that this is not the true caliber of this intelligent Chief. The guilty are always afraid hence this insecurity shown by this chitimukulu. He knows he is not the rightful heir to the throne. 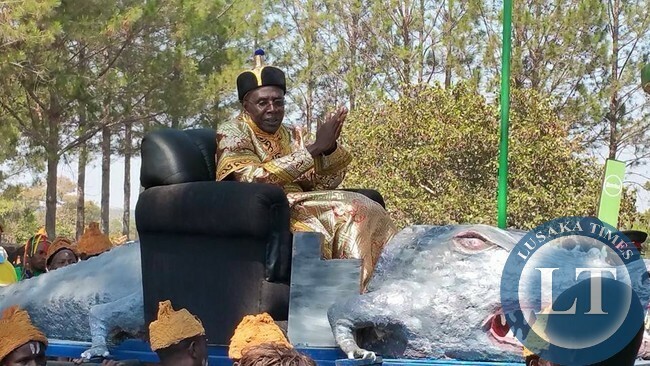 “Opposition intends to Coronate HH as the Paramount Chief of the Namwala” should have been a befitting heading. His royal highness is right to be on the throne. The gods will choose who ever they Please. He was chosen before he was born and it should pass. He is the reincarnation of kanyanta manga I and his Destiny is as such. those who shall be old enough to live shall bearwitness. @Shimwamba; If the Chief knew what you’re saying, he would just keep quiet. Why is he reacting to rumours?